FDA Asks For Proof That Antibacterial Soaps Protect Health : Shots - Health News Many soaps and other consumer products have chemicals that are advertised as antibacterial. But there's no evidence that they actually keep people from getting sick, the FDA says. And they may increase the threat of bacteria that are resistant to antibiotics. In hospitals, people are bathed with soaps containing the antibacterial triclosan to reduce the risk of serious infections in surgery. But that doesn't necessarily mean we should be using triclosan soap in the kitchen and the bathroom, the Food and Drug Administration says. The agency on Monday took a step toward restricting the use of triclosan and other antibacterial chemicals widely used in soap, deodorant, cosmetics and hundreds of other consumer products. The FDA told manufacturers that they would have to prove the chemicals are safe for long-term daily use and that they do a better job of keeping people from getting sick than washing hands with plain soap and water. The agency said that so far there is "no evidence" that antimicrobial soap products keep kids healthier or reduce the spread of colds and flu more than regular soap. The only study showing health benefits in consumer products has been with Total toothpaste, where triclosan reduced the risk of gingivitis. If manufacturers of other products can't come up with evidence of health benefits, the FDA told companies in a proposed rule, they would need to reformulate or relabel products to keep them on the market. The rule gives manufacturers a year to compile the data. The companies will supply those data, according to a spokesman for the American Cleaning Institute, a trade association. "We are perplexed that the agency would suggest there is no evidence that antibacterial soaps are beneficial," Brian Sansoni told The Associated Press. "Our industry sent the FDA in-depth data in 2008 showing that antibacterial soaps are more effective in killing germs when compared with non-antibacterial soaps." There's some evidence suggesting that widespread use of triclosan, which is used in liquid soaps, and triclocarban, which is used in bar soaps, could lead to the development of germs that are resistant to antibiotics. Other studies have found that exposure to these chemicals disrupts hormone cycles in animals. But it's not known whether they have the same effect in humans. "This is one of those areas where we don't have complete medical information," says Dr. Aaron Glatt, executive vice president at Mercy Medical Center in Rockville Centre, N.Y., and a spokesman for the Infectious Diseases Society of America. "But there really is very little evidence that this is truly going to make any difference with hygiene," Glatt told Shots. Given the theoretical risks and little proof of benefit, Glatt says, it makes sense to skip the antibacterial soap. "We don't know the risks and we don't really know the benefits. I don't think that it's rocket science. You make a common-sense decision. You do the least harm." The FDA's proposed rule-making doesn't affect the use of these chemicals in hospitals, where they are used in higher concentrations. "In the operating room you want things more sterile than in your office," Glatt notes. The question of whether triclosan should be in consumer products has been asked almost since the introduction of the products back in the 1970s. The FDA issued a draft back in 1978 but didn't issue a proposed rule until Monday. 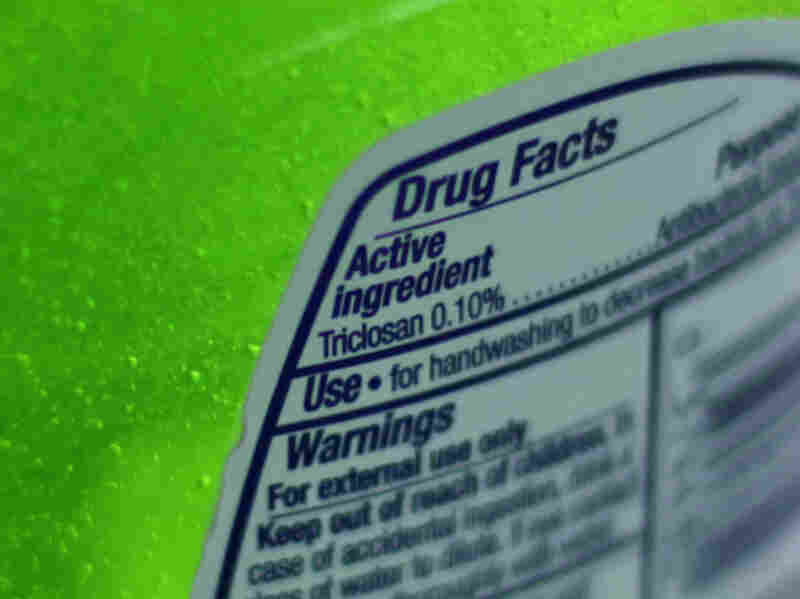 In 2009, Food and Water Watch and other environmental groups petitioned the FDA to ban triclosan in consumer products. "They're moving a lot more slowly than we're asking for, but at least they're doing something," Patti Lovera, the group's assistant director, told Shots Monday. Earlier this year, the governor of the state of Minnesota signed an executive order phasing out the use of products with triclosan by state agencies. The Environmental Protection Agency, which regulates the use of triclosan as a pesticide, last reviewed the safety of triclosan in 2008. It says it is starting another review of the issue.